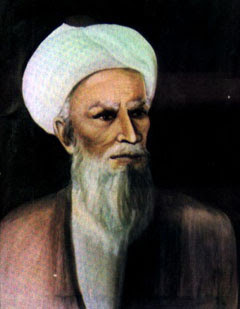 Abu Bakr Muhammad ibn Zakariya al-Razi, or recognized as Rhazes in the West is one of Iran's science expert who lived between the years 864-930. He was born in Rayy, Tehran H./865 in 251 and died in 313 H/925. At the beginning of his life, al-Razi was interested in art music. But al-Razi also interested in many other sciences, so most of his life was spent to study sciences such as chemistry, philosophy, logic, mathematics and physics. Although in the end he was known as a treatment such as Ibn Sina, al-Razi in the beginning was a chemist.? According to a tradition cited by Nasr (1968), al-Razi left the world of chemistry because his eyesight began to blur from experiment to experiment chemistry and chemical sciences with an extensive lunch and then studied medicine-medicine, which seemed to interest him in his youth. He said that a patient who has recovered from her illness was caused by a chemical reaction response contained in the patient's body. In a relatively quick, he established a hospital at Rayy, one of the famous hospital as a center for research and medical education.? A short time later, he is also believed to lead the hospital in Baghdad .. Some western scientists argue that he is also the founder of modern chemistry. This is evidenced by the results of the paper and the findings of his experiments. chemistry in a simple and rational. As a chemist, he was the first capable of producing sulfuric acid and some other acids and alcohol use for the fermentation of sweet substances. Kitab al Asrar, who discusses the techniques of handling chemicals and benefits. Liber Experimentorum, Ar-Razi discussed the division of substances into animals, plants and minerals, which became the forerunner of organic chemistry and inorganic chemistry. LMU and the search for drugs rather than sources of plants, animals, and minerals, as well as symbols and the best type for each one to use the maintainability. Science and equipment are essential for chemistry and pharmacy. Science and seven chemical procedures and techniques involving the processing of mercury, sulfur (sulfur), arsenic and other metals such as gold, silver, copper, lead, and iron.